ARE EAGLES THE STARS OF THE NFC EAST? LAST year the Eagles were running away with the division before we stumbled and ultimately fumbled the division away to a Cowboys team that was more lucky than good. The Cowchips finished 12-4 to our 10-6, but it would seem that no one has much respect for what they did last year, because everyone knows that it had more to do with us losing than it did with them winning. The Cowboys just aren’t good enough be this divisions stars. Don’t get me wrong. I’m not saying that the Cowboys season last year was a fluke. In fact I think they went 12-4 partly because they played a smarter brand of football. It just wouldn’t have been good enough if we didn’t screw up near the end. They did enough to be in a position to get that lucky bounce when we gifted the division to them. However, the Cowboys have ripped out the engine that powered them, and now simply don’t have the parts to do what they need to, in order to win the East again. 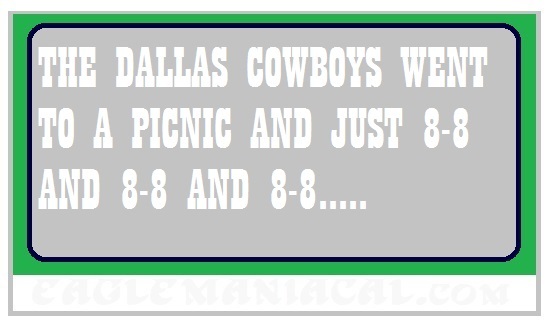 I hope Cowboys fans enjoyed last year, because for them, it’s picnic time again. LOL….there’s my fav meme of yours Eagle…..picnic time!! !